The PowerPoint presentation slides below are from a session delivered to Derbyshire Football Clubs on 15th February 2018. The attached guidance below is to help applicants to Sport England's Small Grants fund. It provides prompts to help you complete the description and the 5 main narrative sections of the form. Also below is Sport England's Small Grants Check List. It is recommended that you complete this first, to check whether this fund is suitable for your project. Click below for the hints and tips to help you complete Sport England's Small Grants form. If you are interested in applying to Sport England's Community Asset Fund, use our check list to see if this fund is suitable. Sport England has uploaded a helpful interactive funding video on their Club Matters website. It explores some of the common questions you will be asked in funding applications. It will help you think about what funders (particularly Sport England) are looking for and it gives you some of their top tips on what you should consider in your answers. You can view a short demo of the video - click the link in the picture on the right. However, to be able to view the full version or to access the transcript, you will need to register to logon to the Club Matters website. Registration is free and there are other useful training resources for clubs on the website. Click here to go to the Club Matters website. 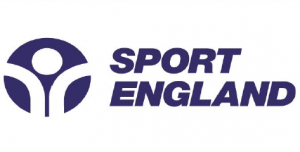 If applying to Sport England for funding, there is a mandatory set of requirements which applicant organisations must meet to be awarded a grant. Applicants applying for funding on a one-off basis (for example, for a specific project which has a finite life); and where the total amount of funding is less than or equal to £250k, will need to meet at least the Tier 1 requirements. 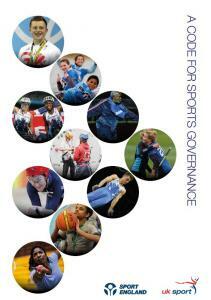 Click here for the full Code for Sports Governance. See the document below for a brief summary of the requirements for Tier 1 organisations. The Big Lottery has published the guidance their officers use to help them assess an Awards for All application. It is very useful to refer to this guidance when completing the application form. It helps to highlight how the points are distributed and where to focus most attention. For example if your project can meet two or more of their outcomes, then your project will be awarded 60 points. The more points you can get, the more likely your application will be successful. Also, click here for a short four minute film about completing the Awards for All application form. Click below for the Awards for All scoring guidance. Taking care with the finer points of your funding application can make a real difference. It's can be a difficult, daunting and time consuming challenge putting together a bid for funding, but Derbyshire Sport has put together a 10-point guide to assist the process. 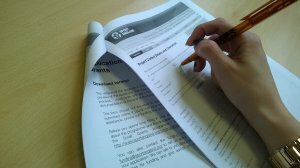 1) Always read the guidance notes first before you start to fill in the application form. They often provide useful information to help you complete the form. 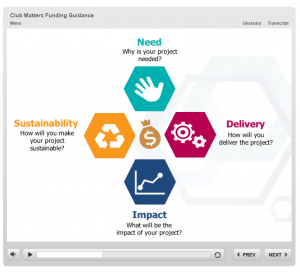 2) Check that your organisation and project are eligible for funding and clearly explain in your application how you can meet the funder's criteria. 3) Phone the funder if you have any queries regarding the grant if you can't find the answer to your question in their guidance. Most funders, particularly the large funders such as Sport England have dedicated staff to answer funding queries. 4) Plan your project. This will save time, money and many future problems. Also some funders (e.g. Sport England's Small Grant programme) like to see evidence of the plan when you apply. 5) Write as if the funder has no prior knowledge of your club/group, sport, local area or project activity and avoid jargon. 8) The majority of grant funders like to see good evidence of need. The best evidence can often be provided by responses to surveys / consultation about your project idea. Project specific letters of support can also provide good evidence. 9) Be as creative and innovative as possible with your project ideas as funders are often oversubscribed. Also clearly describe your project. Your project needs to stand out, so put yourself in the funder's position and think whether you would support the project from the information provided. 10) Ensure that all the supporting information requested is sent with your application.